Posted by NirSoft on November 24, 2011 at 10:55 am under Utilities Update. SafariCacheView is a new utility for Windows that reads and parses the cache file of Safari Web browser (cache.db) and displays the list of all cached files in a simple table. Every cache information line includes the following information: Filename, Content Type, URL, Content Length, Server Name, Server Time, Expiration Time, Last Modified Time, Content Encoding, and Referrer. 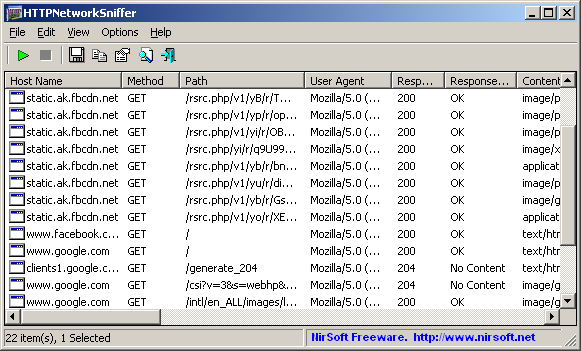 SafariCacheView also allows you to select one or more cache items and then extract them into the desired folder or save the cache list into html/text/xml/csv file. You can download the new SafariCacheView utility from this Web page. Posted by NirSoft on November 9, 2011 at 4:11 am under Utilities Update.